Die Veneris, 16° Decembris 1831. 1st Report from Appeal Com ee. Nottidge & Black v. Prichard. Crawfurd to enter into a Recogce on it. Laws of New South Wales (1828) delivered. Laws of Van Diemen's Land (1826 to 1830) delivered. Slave Population, Papers respecting, delivered. Crown Lands in New South Wales, &c. Papers respecting, delivered. Communications of the Irish Government respecting Tithes, Address for. Tithes, (Ireland,) Papers respecting, Ordered. Com ee on Tithes, (Ireland,) Witnesses to attend. Curates & Non-resident Incumbents, Papers respecting, delivered. Ds. Chaworth. March. Lansdowne, Præses. The Earl of Shaftesbury reported from the Lords Committees appointed to consider of the Causes in which Prints of the Parties Cases, now depending in this House in Appeals and Writs of Error, have not been delivered, pursuant to the Standing Orders of this House, and of other Matters relating thereto; and to report to the House; and to whom were referred certain Petitions in the following Causes; Thornhill and others against Hall; Cameron against Mackie and others; Cranstoun and Company against Bontine; Miller and others against Miller; Hunter and another against Duff and others; the Two Causes Patison junior and others against Allan and Company and others; Whittet or Greig and another against Johnston and others; Grahame against Alison and others; The Duke of Argyll and another against Macalister and another; Logan and others against Wienholt and another; and Baillie against Grant; "That the Committee had met, and considered the Respondents Petitions in the Causes Thornhill and others against Hall, Cameron against Mackie and others, Cranstoun and Company against Bontine, Miller and others against Miller, Hunter and another against Duff and others, and the Two Causes Patison junior and others against Allan and Company and others, severally praying their Lordships for Leave to lodge their printed Cases; and had heard the Agents thereon, and the Committee are of Opinion, That the Petitioners may respectively be allowed now to deliver in their printed Cases: That the Committee had also considered the Respondents Petition in the Cause Whittet or Greig and another against Johnston and others, praying their Lordships to permit their Case to be lodged within a Week; and had heard the Agents thereon, and the Committee are of Opinion, That the Petitioners may be allowed to deliver in their printed Case within a Week: That the Committee had also considered the Appellant's Petition in the Cause Grahame against Alison and others, praying their Lordships that his Petition of Appeal may be restored to the List of Appeals, and that he may now have the customary Time, by himself or his Surety, to enter into the usual Recognizance to prosecute the said Appeal; and had heard the Appellant's Agent thereon, and the Committee are of Opinion, That the said Appeal may, under the Circumstances of the Case, be restored to the List of Appeals, and that the Petitioner may be allowed, by himself or his Surety, to enter into the usual Recognizance within Fourteen Days: That the Committee had also considered the Appellants Petition in the Cause The Duke of Argyll and another against Macalister and another, praying their Lordships that they may have Leave to amend their said Appeal, by striking out therefrom the Interlocutors of the Lord Ordinary, of the 12th of November 1829, the 22d of May 1830 and the 6th of July 1330, they amending the Respondents Copy; and had heard the Agents thereon, and the Committee are of Opinion, That the Petitioners may be allowed to amend their said Appeal by striking out therefrom the said Interlocutors, as desired, they amending the Respondents Copy: That the Committee had also considered the Petition of John Daniel Birkett, One of the Appellants in the Cause Logan and others against Wienholt and another, and also Executor of the last Will and Testament of Sarah Logan deceased, late One of the Appellants in the said Cause, praying their Lordships that the Appeal may stand revived in the Name of the Petitioner as such Executor, in the Place and Stead of the said late Appellant Sarah Logan, and that he may, as such Executor, have the same Benefit of the said Appeal as the said Sarah Logan could or might have had if she had continued living; and had heard the Agents thereon, and the Committee are of Opinion, That the said Appeal may stand revived in the Name of the Petitioner, as such Executor, in the Place and Stead of the late Appellant Sarah Logan, as desired, and that he should have the same Benefit of the Appeal as the said Sarah Logan could or might have had if she had continued living: And that the Committee had also considered the Petition of Mrs. Catherine Baillie, Widow and Personal Representative of Alexander Baillie, late the Appellant in the Cause Baillie against Grant, praying their Lordships that the said Appeal may be revived, and be in the same Plight and Condition as the same was in at the Time of the Death of the said Appellant, and that the Petitioner may be at liberty to prosecute the said Appeal in her Name; and had heard the Agents thereon, and the Committee are of Opinion, That the said Appeal may be revived, and be in the same Plight and Condition as the same was in at the Time of the Death of the said Appellant; and that the Petitioner may be at liberty to prosecute the said Appeal in her Name, as such Personal Representative, as desired." Upon reading the Petition and Appeal of William Nottidge and Richard Black, complaining of an Order and Decree of the Court of Chancery, of the 5th of July 1831, made in Two certain Causes, in the first of which George Prichard was Plaintiff, and Sir Thomas Maryon Wilson Baronet and Carter Draper were Defendants, and in the second, George Prichard was Plaintiff, and William Nottidge, Richard Black and John Stride were Defendants, by Original and Amended Bill, and Bills of Revivor and Supplement; and praying, "That the said Order and Decree may be reversed, or that the Appellants may have such Relief in the Premises, as to this House, in their Lordships great Wisdom, shall seem meet; and that the said George Prichard may be required to answer the said Appeal:"
It is Ordered, That the said George Prichard may have a Copy of the said Appeal, and do put in his Answer thereunto, in Writing, on or before Friday the 30th Day of this instant December; and Service of this Order upon the said Respondent, or upon his Solicitor or Clerk in Court, shall be deemed good Service. Upon reading the Petition and Appeal of John Miller, Baker in London, William Roy of Pentoul, Tenant of the Farm of Coudie, and William Thomson, Writer in Kinross; complaining of Two Interlocutors of the Lords of Session in Scotland, of the First Division, of the 4th of March and 14th of May 1831; and praying, "That the same may be reversed, varied or altered, or that the Appellants may have such other Relief in the Premises, as to this House, in their Lordships great Wisdom, shall seem meet; and that Mrs. Amelia Moodie or Anderson Widow may be required to answer the said Appeal:"
It is Ordered, That the said Mrs. Amelia Moodie or Anderson may have a Copy of the said Appeal, and do put in her Answer thereunto, in Writing, on or before Friday the 30th Day of January next; and Service of this Order upon her, or upon any one of her known Agents in the Court of Session in Scotland, shall be deemed good Service. The House being moved, "That Robert Maclintok Crawfurd of Lincoln's Inn Fields, in the County of Middlesex, Gentleman, may be permitted to enter into a Recognizance for John Miller, and others, on account of their Appeal depending in this House:"
"Copies of the Laws and Ordinances passed by The Governor and Council of the Colony of New South Wales-1828;" together with a Table thereof. 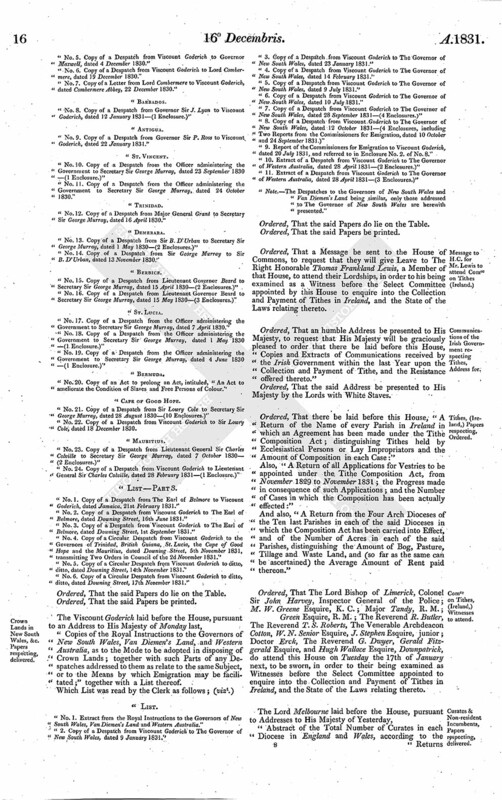 Table of the Titles of Acts and Ordinances in Council, 1828. Index to Acts of Parliament adopted." "No. 1. An Act for adopting certain Acts of Parliament passed during the Seventh and Eighth Years of His present Majesty King George the Fourth, for the Amendment of the Law, and the Improvement of the Administration of Justice in Criminal Cases. [26th March 1828.]" "No. 2. An Act for adopting a certain Act of Parliament passed in the Seventh and Eighth Years of His Majesty King George the Fourth, to regulate the Practice of Arrests. [26th March 1828.]" "No. 3. An Act to enable the Proprietors of a certain Banking Company heretofore carried on at Sydney under the Name and Designation of the Bank of New South Wales, commonly called the Old Bank of New South Wales, to sue and be sued in the Name of the President for the Time being of the said Bank; and also to enable the Proprietors of a certain Banking Company to be established in Sydney under the Name, Style and Firm of the Bank of New South Wales, commonly called the New Bank of New South Wales, to sue and be sued, in like Manner, in the Name of the President for the Time being; and for other Purposes therein mentioned. [31st March 1828.]" "No. 4. An Act for ascertaining the Number, Names and Condition of the Inhabitants of the Colony of New South Wales, and also the Number of Cattle, and the Quantity of located, cleared and cultivated Land within the said Colony. [30th June 1828.]" "No. 5. An Act for the better Regulation of the Hulk or Floating Prison in Sydney Harbour, and for establishing Houses of Correction in the Colony. [30th June 1828.]" "No. 6. An Act for enabling the Governor or Acting Governor of New South Wales to grant Letters of Denization to such Foreigners as may arrive in the Colony with a Recommendation to that Effect from His Majesty's Principal Secretary of State for the Colonies. [3d July 1828.]" "No. 7. An Act to regulate the keeping and Carriage of Gunpowder imported into the Colony of New South Wales. [3d July 1828.]" "No. 8. An Act for enabling Persons holding certain Public Offices in New South Wales to take Apprentices to serve under them and their Successors in Office; and for regulating all Matters relative to Masters and Apprentices. [17th July 1828.]" "No. 10. An Act for the more effectually preventing Persons from purchasing or receiving Clothing, Bedding or Rations from Convicts. [17th July 1828]"
"No. 11. An Act to authorize the Erection of Pounds, and for regulating the impounding of Cattle. [24th July 1828.]" "No. 12. An Act to regulate the dividing Fences of adjoining Lands. [2d August 1828.]" "No. 13. An Act to regulate the licensing of Auctioneers, and the Collection of Duties on Property sold by Auction. [9th August 1828.]" "No. 14. An Act for regulating Places of Public Exhibition and Entertainment. [1st September 1828.]" "An Act for the summary Punishment of disorderly Conduct in Female Offenders in the Service of the Government or of any Inhabitant of Van Diemen's Land, &c. &c."
"An Act for regulating the future Sale of Ale, Beer, Wine, Spirits, and other Liquors by Retail, &c. &c."
"An Act to promote the Circulation of Sterling Money of Great Britain, and to reduce to Sterling Denomination all Securities and Agreements for the Payment of Money, &c. &c."
"An Act to explain and amend an Act, intituled, "An Act for regulating the future Sale of Ale, Beer, Wine, Spirits, &c. &c."
"An Act to regulate the printing and publishing of Newspapers, and for the Prevention of Blasphemous and Seditious Libels." "An Act for imposing a Duty upon Newspapers, and upon all Licences to print and publish the same." "An Act for the Transportation of Offenders from Van Diemen's Land." "An Act to provide for the Registration of Deeds, Wills, Judgements, and Conveyances affecting Real Property." 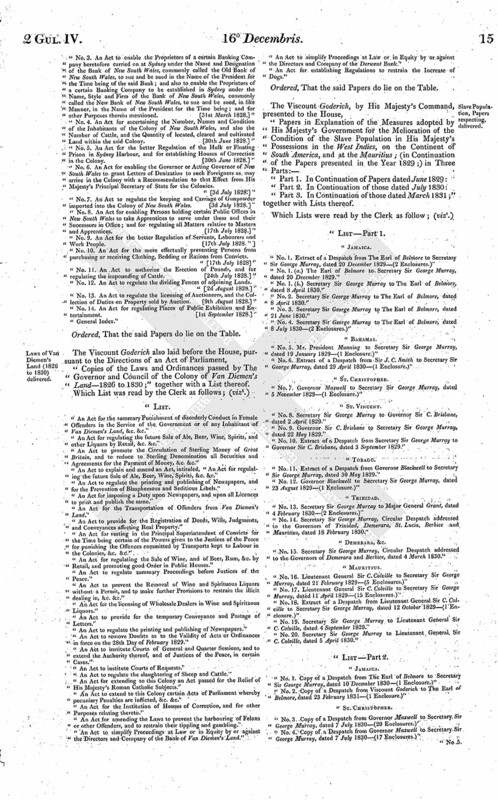 "An Act for vesting in the Principal Superintendent of Convicts for the Time being certain of the Powers given to the Justices of the Peace for punishing the Offences committed by Transports kept to Labour in the Colonies, &c. &c."
"An Act for regulating the Sale of Wine, and of Beer, Rum, &c. by Retail, and promoting good Order in Public Houses." "An Act to regulate summary Proceedings before Justices of the Peace." "An Act to prevent the Removal of Wine and Spirituous Liquors without a Permit, and to make further Provisions to restrain the illicit dealing in, &c. &c."
"An Act for the licensing of Wholesale Dealers in Wine and Spirituous Liquors." "An Act to provide for the temporary Conveyance and Postage of Letters." "An Act to regulate the printing and publishing of Newspapers." "An Act to remove Doubts as to the Validity of Acts or Ordinances in force on the 28th Day of February 1829." "An Act to institute Courts of General and Quarter Sessions, and to extend the Authority thereof, and of Justices of the Peace, in certain Cases." "An Act to institute Courts of Requests." "An Act to regulate the slaughtering of Sheep and Cattle." 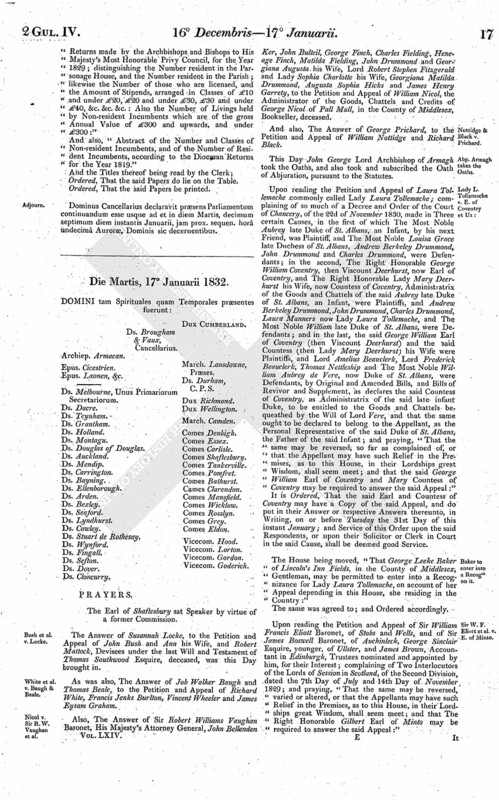 "An Act for extending to this Colony an Act passed for the Relief of His Majesty's Roman Catholic Subjects." "An Act to extend to this Colony certain Acts of Parliament whereby pecuniary Penalties are inflicted, &c. &c."
"An Act for the Institution of Houses of Correction, and for other Purposes relating thereto." "An Act for amending the Laws to prevent the harbouring of Felons or other Offenders, and to restrain their tippling and gambling." "An Act to simplify Proceedings at Law or in Equity by or against the Directors and Company of the Bank of Van Diemen's Land." "An Act to simplify Proceedings at Law or in Equity by or against the Directors and Company of the Derwent Bank." "An Act for establishing Regulations to restrain the Increase of Dogs." "Part 3. In Continuation of those dated March 1831;" together with Lists thereof. "No. 1. Extract of a Despatch from The Earl of Belmore to Secretary Sir George Murray, dated 20 December 1829-(2 Enclosures.)" "No. 1. (a.) The Earl of Belmore to Secretary Sir George Murray, dated 20 December 1829." "No. 1. (b.) Secretary Sir George Murray to The Earl of Belmore, dated 8 April 1830." "No. 2. Secretary Sir George Murray to The Earl of Belmore, dated 8 April 1830." "No. 3. Secretary Sir George Murray to The Earl of Belmore, dated 21 June 1830." "No. 4. Secretary Sir George Murray to The Earl of Belmore, dated 8 July 1830-(2 Enclosures.)" "No. 5. Mr. President Munning to Secretary Sir George Murray, dated 19 January 1829-(1 Enclosure.)" "No. 6. Extract of a Despatch from Sir J. C. Smith to Secretary Sir George Murray, dated 29 April 1830-(1 Enclosure.)" "No. 7. Governor Maxwell to Secretary Sir George Murray, dated 5 November 1829-(1 Enclosure.)" "No. 8. Secretary Sir George Murray to Governor Sir C. Brisbane, dated 2 April 1829." "No. 9. Governor Sir C. Brisbane to Secretary Sir George Murray, dated 22 May 1829." "No. 10. Extract of a Despatch from Secretary Sir George Murray to Governor Sir C. Brisbane, dated 3 September 1829." "No. 11. Extract of a Despatch from Governor Blackwell to Secretary Sir George Murray, dated 30 May 1829." "No. 12. Governor Blackwell to Secretary Sir George Murray, dated 23 August 1829-(1 Enclosure.)" "No. 13. Secretary Sir George Murray to Major General Grant, dated 4 February 1830-(2 Enclosures.)" "No. 14. Secretary Sir George Murray, Circular Despatch addressed to the Governors of Trinidad, Demerara, St. Lucia, Berbice and Mauritius, dated 18 February 1830." "No. 15. Secretary Sir George Murray, Circular Despatch addressed to the Governors of Demerara and Berbice, dated 4 March 1830." "No. 16. Lieutenant General Sir C. Colville to Secretary Sir George Murray, dated 21 February 1829-(5 Enclosures.)" "No. 17. Lieutenant General Sir C. Colville to Secretary Sir George Murray, dated 11 April 1829-(15 Enclosures.)" "No. 18. Extract of a Despatch from Lieutenant General Sir C. Colville to Secretary Sir George Murray, dated 12 October 1829-(1 Enclosure.)" "No. 19. Secretary Sir George Murray to Lieutenant General Sir C. Colville, dated 4 September 1829." "No. 20. Secretary Sir George Murray to Lieutenant General, Sir C. Colville, dated 5 April 1830." "No. 1. Copy of a Despatch from The Earl of Belmore to Secretary Sir George Murray, dated 10 December 1830-(1 Enclosure.)" "No. 2. Copy of a Despatch from Viscount Goderich to The Earl of Belmore, dated 23 February 1831-(1 Enclosure.)" "No. 3. Copy of a Despatch from Governor Maxwell to Secretary Sir George Murray, dated 7 July 1830-(20 Enclosures.)" "No. 4. Copy of a Despatch from Governor Maxwell to Secretary Sir George Murray, dated 7 July 1830-(17 Enclosures.)" "No. 5. Copy of a Despatch from Viscount Goderich to Governor Maxwell, dated 4 December 1830." "No. 6. Copy of a Despatch from Viscount Goderich to Lord Combermere, dated 19 December 1830." "No. 7. Copy of a Letter from Lord Combermere to Viscount Goderich, dated Combermere Abbey, 22 December 1830." "No. 8. Copy of a Despatch from Governor Sir J. Lyon to Viscount Goderich, dated 12 January 1831-(1 Enclosure.)" "No. 9. Copy of a Despatch from Governor Sir P. Ross to Viscount Goderich, dated 22 January 1831." "No. 10. Copy of a Despatch from the Officer administering the Government to Secretary Sir George Murray, dated 23 September 1830 -(1 Enclosure.)" "No. 11. Copy of a Despatch from the Officer administering the Government to Secretary Sir George Murray, dated 24 October 1830." "No. 12. Copy of a Despatch from Major General Grant to Secretary Sir George Murray, dated 16 April 1830." "No. 13. Copy of a Despatch from Sir B. D'Urban to Secretary Sir George Murray, dated 1 May 1830-(2 Enclosures.)" "No. 14. Copy of a Despatch from Sir George Murray to Sir B. D'Urban, dated 13 November 1830." "No. 15. Copy of a Despatch from Lieutenant Governor Beard to Secretary Sir George Murray, dated 15 April 1830-(2 Enclosures.)" "No. 16. Copy of a Despatch from Lieutenant Governor Beard to Secretary Sir George Murray, dated 15 May 1830-(3 Enclosures.)" "No. 17. Copy of a Despatch from the Officer administering the Government to Secretary Sir George Murray, dated 7 April 1830." "No. 18. Copy of a Despatch from the Officer administering the Government to Secretary Sir George Murray, dated 1 May 1830 -(1. Enclosure.)" "No. 19. Copy of a Despatch from the Officer administering the Government to Secretary Sir George Murray, dated 4 June 1830 -(1 Enclosure.)" "No. 20. Copy of an Act to prolong an Act, intituled, "An Act to ameliorate the Condition of Slaves and Free Persons of Colour." "No. 21. Copy of a Despatch from Sir Lowry Cole to Secretary Sir George Murray, dated 28 August 1830-(10 Enclosures.)" "No. 22. Copy of a Despatch from Viscount Goderich to Sir Lowry Cole, dated 18 December 1830. "No. 23. Copy of a Despatch from Lieutenant General Sir Charles Colville to Secretary Sir George Murray, dated 7 October 1830- (2 Enclosures.)" "No. 24. Copy of a Despatch from Viscount Goderich to Lieutenant General Sir Charles Colville, dated 28 February 1831-(1 Enclosure.)" "No. 1. Copy of a Despatch from The Earl of Belmore to Viscount Goderich, dated Jamaica, 21st February 1831." "No. 2. Copy of a Despatch from Viscount Goderich to The Earl of Belmore, dated Downing Street, 16th June 1831." "No. 3. Copy of a Despatch from Viscount Goderich to The Earl of Belmore, dated Downing Street, 1st September 1831." "No. 4. Copy of a Circular Despatch from Viscount Goderich to the Governors of Trinidad, British Guiana, St. Lucia, the Cape of Good Hope and the Mauritius, dated Downing Street, 5th November 1831, transmitting Two Orders in Council of the 2d November 1831." "No. 5. Copy of a Circular Despatch from Viscount Goderich to ditto, ditto, dated Downing Street, 14th November 1831." "No. 6. Copy of a Circular Despatch from Viscount Goderich to ditto, ditto, dated Downing Street, 17th November 1831." "Copies of the Royal Instructions to the Governors of New South Wales, Van Diemen's Land, and Western Australia, as to the Mode to be adopted in disposing of Crown Lands; together with such Parts of any Despatches addressed to them as relate to the same Subject, or to the Means by which Emigration may be facilitated;" together with a List thereof. "No. 1. Extract from the Royal Instructions to the Governors of New South Wales, Van Diemen's Land and Western Australia." "2. Copy of a Despatch from Viscount Goderich to The Governor of New South Wales, dated 9 January 1831." "3. Copy of a Despatch from Viscount Goderich to The Governor of New South Wales, dated 23 January 1831." "4. Copy of a Despatch from Viscount Goderich to The Governor of New South Wales, dated 14 February 1831." "5. Copy of a Despatch from Viscount Goderich to The Governor of New South Wales, dated 9 July 1831." "6. Copy of a Despatch from Viscount Goderich to The Governor of New South Wales, dated 10 July 1831." "7. Copy of a Despatch from Viscount Goderich to The Governor of New South Wales, dated 28 September 1831-(4 Enclosures.)" "8. Copy of a Despatch from Viscount Goderich to The Governor of New South Wales, dated 12 October 1831-(4 Enclosures, including Two Reports from the Commissioners for Emigration, dated 10 October and 24 September 1831.)" "9. 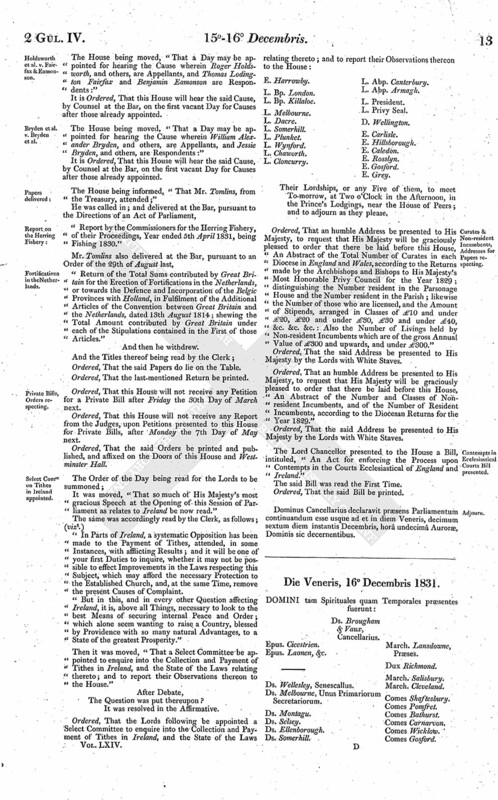 Report of the Commissioners for Emigration to Viscount Goderich, dated 20 July 1831, and referred to in Enclosure No. 2. of No. 8." "10. Extract of a Despatch from Viscount Goderich to The Governor of Western Australia, dated 28 April 1831-(2 Enclosures.)" "11. Extract of a Despatch from Viscount Goderich to The Governor of Western Australia, dated 28 April 1831-(3 Enclosures.)" "Note.-The Despatches to the Governors of New South Wales and Van Diemen's Land being similar, only those addressed to The Governor of New South Wales are herewith presented." Ordered, That a Message be sent to the House of Commons, to request that they will give Leave to The Right Honorable Thomas Frankland Lewis, a Member of that House, to attend their Lordships, in order to his being examined as a Witness before the Select Committee appointed by this House to enquire into the Collection and Payment of Tithes in Ireland, and the State of the Laws relating thereto. Ordered, That an humble Address be presented to His Majesty, to request that His Majesty will be graciously pleased to order that there be laid before this House, "Copies and Extracts of Communications received by the Irish Government within the last Year upon the Collection and Payment of Tithe, and the Resistance offered thereto." Ordered, That there be laid before this House, "A Return of the Name of every Parish in Ireland in which an Agreement has been made under the Tithe Composition Act; distinguishing Tithes held by Ecclesiastical Persons or Lay Impropriators and the Amount of Composition in each Case:"
Also, "A Return of all Applications for Vestries to be appointed under the Tithe Composition Act, from November 1829 to November 1831; the Progress made in consequence of such Applications; and the Number of Cases in which the Composition has been actually effected:"
And also, "A Return from the Four Arch Dioceses of the Ten last Parishes in each of the said Dioceses in which the Composition Act has been carried into Effect, and of the Number of Acres in each of the said Parishes, distinguishing the Amount of Bog, Pasture, Tillage and Waste Land, and (so far as the same can be ascertained) the Average Amount of Rent paid thereon." Green Esquire, R. M.; The Reverend R. Butler, The Reverend T. S. Roberts, The Venerable Archdeacon Cotton, W. N. Senior Esquire, J. Stephen Esquire, junior; Doctor Erck, The Reverend G. Dwyer, Gerald Fitzgerald Esquire, and Hugh Wallace Esquire, Downpatrick, do attend this House on Tuesday the 17th of January next, to be sworn, in order to their being examined as Witnesses before the Select Committee appointed to enquire into the Collection and Payment of Tithes in Ireland, and the State of the Laws relating thereto. 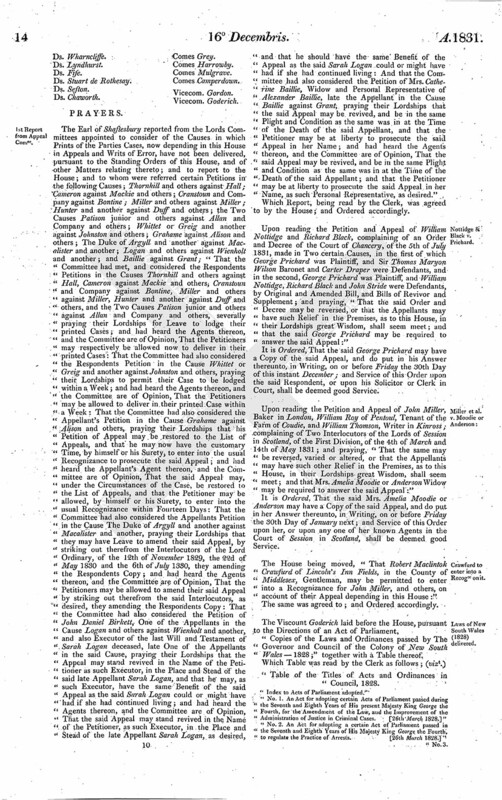 "Abstract of the Total Number of Curates in each Diocese in England and Wales, according to the Returns made by the Archbishops and Bishops to His Majesty's Most Honorable Privy Council, for the Year 1829; distinguishing the Number resident in the Parsonage House, and the Number resident in the Parish; likewise the Number of those who are licensed, and the Amount of Stipends, arranged in Classes of £10 and under £20, £20 and under £30, £30 and under £40, &c. &c. &c.: Also the Number of Livings held by Non-resident Incumbents which are of the gross Annual Value of £300 and upwards, and under £300:"
And also, "Abstract of the Number and Classes of Non-resident Incumbents, and of the Number of Resident Incumbents, according to the Diocesan Returns for the Year 1819." Dominus Cancellarius declaravit præsens Parliamentum continuandum esse usque ad et in diem Martis, decimum septimum diem instantis Januarii, jam prox. sequen. horâ undecimâ Auroræ, Dominis sic decernentibus.